How many laparoscopic hysterectomies has your surgeon performed? Of the hundreds of thousands of hysterectomies performed each year in the United States, a large percentage of women are still only offered open procedures. Patients often don’t know that they can choose a laparoscopic specialist to perform their procedure. Many patients often choose their general practitioner or other generalist like an OBGYN as their surgeon whose training is limited to basic open surgical techniques. According to the American College of Obstetricians and Gynecologists (ACOG), patients have better outcomes for complex conditions like large fibroids or cysts, an enlarged uterus or extensive endometriosis when hysterectomies, myomectomies, and other GYN procedures are performed by skilled, high-volume laparoscopic specialists. Despite the clear benefits of laparoscopic surgery (smaller incisions, faster recovery), few specialists are trained in the advanced techniques needed with a high enough volume to maintain the peak surgical skills essential for ensuring optimal patient outcomes. 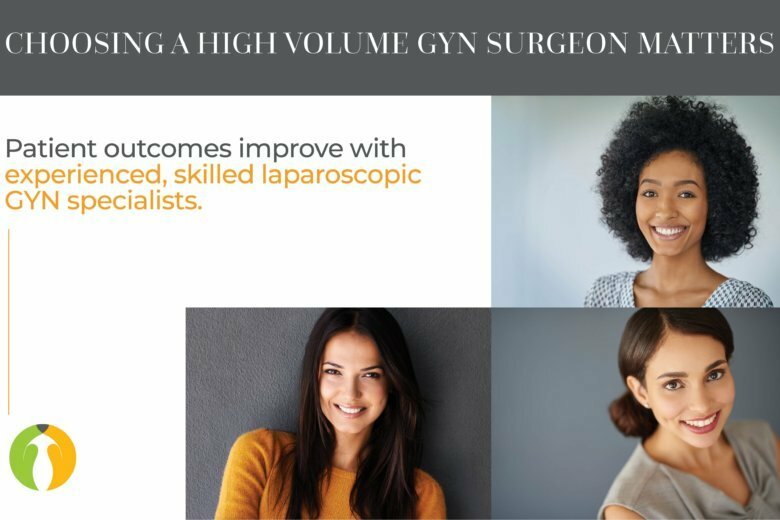 It is important for patients to know what defines a high-volume surgeon, and particularly those with complex GYN conditions, it’s important to know how often your surgeon has encountered patients with similar or greater complexity. On average, an OBGYN performs around 24 hysterectomy procedures each year. A more experienced GYN surgeon performs more than 50 procedures each year. This is the threshold for a high-volume surgeon. For complex cases, it’s important to look for specialists who perform hundreds of these procedures annually. “Surgeons who are able to perform more cases at a higher level of skill often means that they have seen cases with more complexity, and are able to offer a better patient experience overall,” said Paul MacKoul, MD, co-founder of The Center for Innovative GYN Care. “In our clinic, we average 2,000 surgical cases annually, which is unheard of for many small GYN surgical practices. This is far above the 50 plus cases that defines a high-volume GYN surgeon. Andrew Walter, MD stated in his Presidential Address at the 42nd Annual Scientific Meeting of the Society of Gynecologic Surgeons in Palm Springs, CA “Most women undergoing hysterectomy in the United States have their surgery performed by a low-volume gynecologic surgeon. Evidence supports that, when compared to patients operated on by high-volume surgeons, these women have worse outcomes including fewer minimally invasive procedures [these women have more open, invasive surgeries] and increased rates of complications. The factors that promote low-volume surgeons and suggestions for how to change this are reviewed in this Viewpoint.” Every Woman Deserves A High-Volume Gynecologic Surgeon AJOG February 2017. ACOG, the premier society in the United States and around the world for OBGYNs and specialists (including GYN Oncology, Maternal Fetal Medicine, Reproductive Endocrinology and Infertility, and Urogynecology), recognizes the growing need for laparoscopic surgeons who are trained to perform advanced minimally invasive GYN techniques. ACOG created a fellowship program in advanced training for gynecology physicians. The American Association of GYN Laparoscopic Surgeons (AAGL) fellowship is sanctioned by ACOG and allows more and more gynecology physicians to be trained in this advanced field. Advanced training for laparoscopic surgery is essential for the best patient outcomes. This includes performing state-of-the-art techniques that control blood loss and improve the surgeons ability to clearly see into the pelvic cavity during surgery. Higher volume in performing laparoscopy means the surgeon has more opportunities to master complex conditions. It is also essential that the surgeon is trained and certified to perform advanced repairs for bowel and ureters. This is especially significant when endometriosis or pelvic scarring due to inflammation [from previous surgeries] creates a frozen pelvis. This condition occurs when scar tissue forms fusing the pelvic organs together. With conventional surgical techniques, the risk of injury is high in these cases. If performed by a highly skilled laparoscopic specialist, patients are typically able to return home the same day. Recovery from fibroid removal should be 10 to 14 days, hysterectomy or endometriosis excision should be a week or less. Longer recovery times will affect a woman’s quality of life. The specialists at The Center for Innovative GYN Care based in DC, Maryland and Northern Virginia developed LAAM fibroid removal to maintain fertility and DualPortGYN for all GYN conditions including fibroids, endometriosis, ovarian cysts, and pelvic adhesion removal. These techniques are performed as outpatient procedures, so women return home the same day. The incisions are small and placed in the midline. This strategic placement avoids the abdominal muscles, so recovery is faster. LAAM and DualPortGYN use an advanced technique called retroperitoneal dissection. The surgeon is able to see the entire pelvic cavity, and using bilateral uterine artery occlusion to ensure blood loss is minimal. This is an advancement over other procedures that do not control for blood loss, which limits the size and number of fibroids that can be removed. The LAAM minimally invasive technique for myomectomy is an important development, as it allows the CIGC surgeons to feel all of the fibroids. This cannot be accomplished by a robot or with standard laparoscopy. LAAM patients return to their normal selves in about 2 weeks. LAAM uses 2 small incisions, one 5 MM incision at the belly button, and another 1.5 inch incision at the bikini line. Through the lower 1.5 inch incision, the CIGC surgeon can remove the fibroids and repair the uterus so that women who wish to maintain fertility will have a better chance of conceiving and carrying a child to term. The average LAAM procedure takes just over an hour to perform. A DualPortGYN hysterectomy uses just two tiny 5 mm incisions, one at the belly button, and the other at the bikini line. DualPortGYN hysterectomy procedures on average take about 56 minutes. A minimally invasive hysterectomy is recommended for women who have abnormal bleeding and pelvic pain due to adenomyosis and who are finished with child bearing. While fibroids can be removed with a minimally invasive myomectomy, additional fibroids are likely to grow. The only cure for fibroids is a hysterectomy. Choosing the most thorough procedure for a complex GYN condition with the most experienced surgeons means a more efficient (and faster) procedure and recovery is just days. These techniques reduce the risks of anesthesia side effects as well as risks of blood clots from lack of mobility during recovery. CIGC is dedicated to providing information and materials for women to help navigate the complicated healthcare system. CIGC minimally invasive GYN surgical specialists Dr. Paul MacKoul, MD and Dr. Natalya Danilyants, MD developed their advanced GYN surgical techniques using only two small incisions with patients’ well-being in mind. Book a consultation at The Center for Innovative GYN Care or call 888-787-4379.